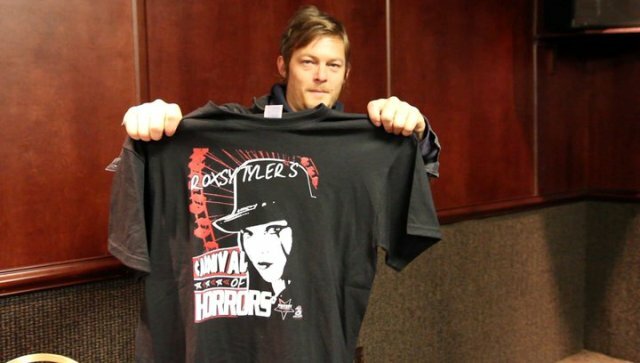 Norman Reedus at Monster Mania! Day Two (March 12, 2011): We arrived around 10am and were joined by my co-host Johnnie 13. Johnnie got his hair cut. I guess because Justin Beiber got his hair cut too. Johnnie 13 and Justin Beiber’s fates are intertwined in some strange way and I don’t approve of it. Mr. Potent and Johnnie left the Monster Channel table to pay a visit to Norman Reedus and the Walking Dead cast. Norman Reedus was previously rumored to have dropped out of the convention but he made it and stayed til late Saturday afternoon. Word around the grapevine was that he was expected on set somewhere to film something. Believe me, Norman Reedus is the nicest guy you’ll ever meet. He was at Monster Mania last August jumping in pictures, walking around in the vendor room, hanging with his fans outside, I think it’s safe to say he loves his fans and he loves doing conventions. Johnnie and Mr. Potent delivered one of my t-shirts to him for me to which he had Johnnie pass along a personalized autograph to give to me. My morning started off great! 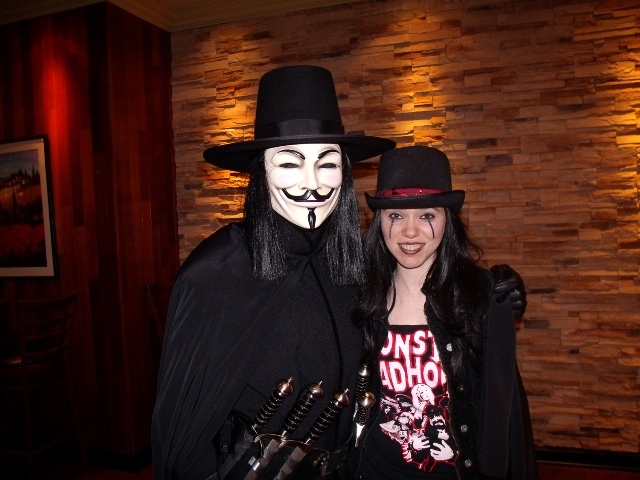 Just when I thought it couldn’t get any better I caught someone dressed as V For Vendetta walking around. I blew kisses at him all day. 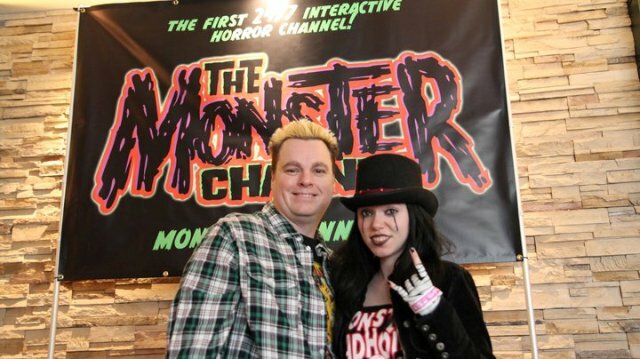 I was due in the lobby to have an interview with Shaun Kern who has been aspiring to become better acquainted with horror hosts via interviews and blogging. He’s following the foot steps of Corpse S. Chris and our Daves! Good for him! It was a joint interview he conducted with myself and Mr. Halloween Jack! My interview was done before Jack arrived but I sat in to listen in on Jack’s and then we answered specific questions together. After the interview, it was a madhouse in the lobby and inside the convention. The hotel was mobbed with people waiting in line to meet Nick Castle and Ace Frehley. I didn’t get in line to meet anyone. It’s not particularly my thing because I’m not an autograph collector or anything. Though I did have a brief encounter with Courtney Gains (Children of the Corn, The Burbs). We happen to have some very awesome friends in common: Brandon E. Brooks and Amel Figueroa worked together with him on an Indie Thriller called The Quiet Ones which I had the pleasure of doing the trailer for. Other than that, I did make sure I met one person during the weekend but I’m saving the best for last. Another highlight of that Saturday was sitting across from the Troma table. The Troma team are always so enthusiastic and fun. Plus, Lloyd Kauffman was there for most of the day accompanied by his wife and someone dressed as the Toxic Avenger. I love the monster. Day Three (March 13, 2011): I was joined by a lot of friends over the weekend including J. Isobel De Lisle who took my famous Facebook picture that I never want to change. Friends I have in my personal life came to see me and show their support for my show. Rob Dimension joined us a lot throughout the weekend at the Monster Channel table. R.A. Mihailoff (Hatchet 2 and TCM 3) visited Rob and I at the table and chatted for a bit. I made sure to pass by his table also before I left. Most importantly a lot of fans and viewers of my show came to visit me which was the most phenomenal feeling in the world. All of you left me this weekend feeling more inspired to keep doing what I do and I thank you for it. The big highlight of my weekend was meeting Stella and Hives from Saturday Night Dead. Stella, the Maneater from Manayunk, hosted horror movies in the 80s’. There was Vampira, there was Elvira, and there was Stella, a legendary horror hostess from my own backyard– Philadelphia, PA. I visited her and Hives whenever I had a chance to take a break from the Monster Channel table. I found out Stella is a fellow TRUE BLOOD fan and Hives is a fellow Marx Brothers fan. I didn’t know much about Stella other than what everyone else might know about her but she was everything I hoped she would be. She was hip, she was friendly, and she was so excited about the convention and the people who came to see her. Hives was also very enthusiastic about being there and he was such a gentleman too. He offered me a seat by the table a few times when I came to visit them. It was very nice. After two minutes I didn’t feel like the three of us were strangers anymore. It was an honor to meet the both of them and I do hope to see them again in the future. This entry was posted in Celebrity Encounters!, Convention & Expos and tagged ACE FREHLEY, Children of the Corn, Halloween Jack, Hatchet, Johnnie 13, Justin Beiber, Monster-Mania, Nick Castle, NORMAN REEDUS, R.A. Mihailoff, Roxy Tyler, Shaun Kern, Stella Desire, Texas Chainsaw Massacre, The Monster Channel, The Walking Dead', Troma. Bookmark the permalink. 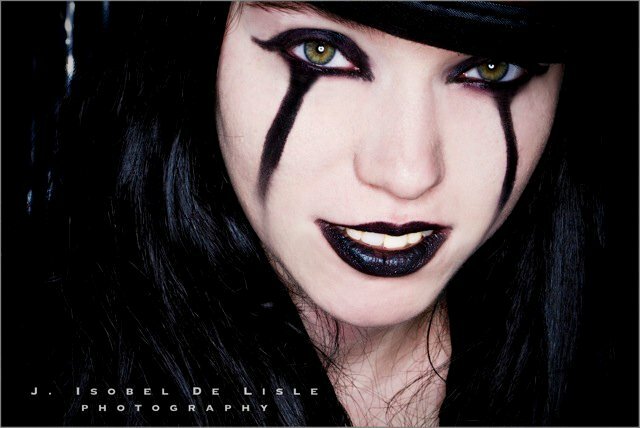 ← Roxsy Tyler, Midnite Mausoleum, & Monster Mania!